Guest Blog: In Crust We Trust! I pledge allegiance to the Bread, and to the Sandwich for which it stands, one meal, between two slices, divisible into halves, with sauces and layers for all. This was my first trip to ModMarket over at Denver West. At first thought, I was heading into a MUZAK store, since their logos are almost identical. However, when I walked in the front door, I saw immediately that this was a different place. It was hip, chic, and smelled pretty good. They had about 10000000 menus posted on the front door, big tv screens, and had handouts. There was a decent line, so I got to take my time thinking about what I wanted. While this seems like it was a while ago, the topic of conversation is still the same. How can you have 2 different “Sandwiches” and have them be so different? This is a little grilled vegetable flatbread standoff from 2 local restaurants. The first was from the Rendezvous Cafe in Denver, and this is a restaurant attached to the History Colorado Center. The museum is a fantastic place to go, very interactive, and really cool exhibits. In one of them, you can even do a ski jump. That has nothing to do with sandwiches, but it is still cool! (Actually, I believe that in the buffalo there, there is a spot for a lunch sack. if you can find it, you get a bonus.) So here is a little back story. We went there as a family, for the Hands on Heritage Festival and we decided to hang out and grab some food. There is a neat little cafe, called the Rendezvous Cafe. They have salads, burgers, sandwiches, etc. It is a little overpriced, but what not any more than any museums normally are. The portions were a little on the small side for what I got, but my large disappointment fell when my food arrived. I ordered a grilled vegetable flatbread, and this is what I got. Maybe my issue comes from a misunderstanding of what I thought I was getting. I thought I was getting a grilled flatbread, not just grilled vegetables in a pita. This thing had broccoli, onions, peppers, goat cheese, balsamic and a severe case of bad distribution. This thing was a structural nightmare. 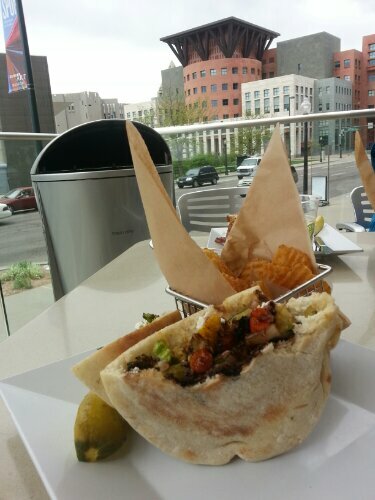 There were no actual layers, as all of the veggies were just tossed into the pita. There were a few pieces of goat cheese tossed in there, but it wasn’t nicely spread. I would have rather had the Pita left closed, and everything tossed on top with the pita folded over it, vs a broken pita filled with veggies. This felt like a bad impression of a D’Angelo’s pita pocket. This was not a flatbread, and it was not a sandwich. The thing fell apart after just a few bites, and there was not a single grill mark on the outside of the sandwich. The veggies were cooked well, and there would have been a good balance between the balsamic, the veggies, and the goat cheese, but without the layering and proper spread of the love, it was more like eating one bite of got cheese, one bite of veggies, then taking a spoonfool of balsamic. So even though it was tasty, I wasn’t very impressed. The views were great, the event was fun, and the museum is great, but if you are looking for a vegetarian sandwich, go with the veggie burger. Fast forward a few days, when the entire family is still hanging out, and we are walking around our fantastic little town. We wanted to go somewhere to get a light meal, and a few adult beverages. We decided on the Bridgewater Grill at the Golden Hotel. 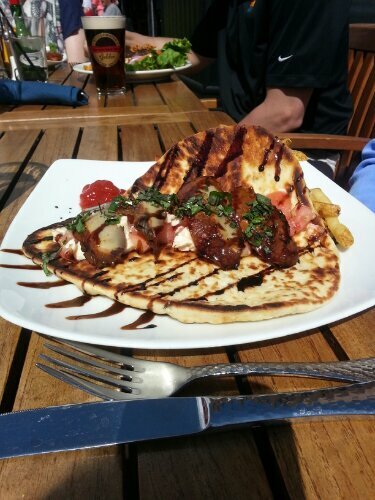 I saw the Caprese Flatbread Sandwich, which had grilled portobella, tomato, fresh mozzarella, basil, and balsamic reduction on a garlic flatbread. When it came, it was better looking than I expected, especially given my recent venture into flatbreads. So this was definitely more along the lines of what I was expecting. The flatbread was actually a flatbread, and it was grilled. You can actually see the grill marks. You can see that they didn’t just throw stuff on the the bread. You can see that they took time to layer the cheese and the eggplant, with the basil and the tomatoes spread throughout. 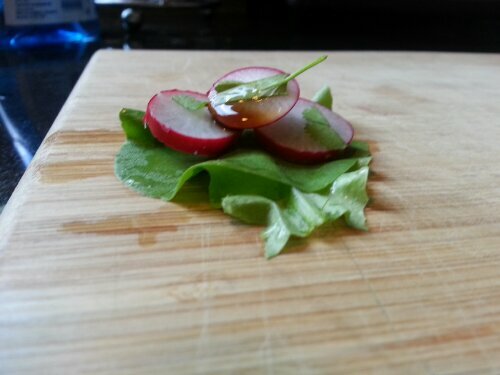 The balsamic is drizzled nicely, and there is that little bit of presentation that goes a long way. Personally, I would have liked to see the goat cheese spread, so you could actually stick the sandwich together, and i would not have minded a few extra veggies in there, but I knew what I was getting. The vegetable to bread ratio was pretty good, and the flavors were tasty. Even though the flatbread was grilled, it was still soft enough that I was able to fold it in half and it didn’t break apart. All in all, I would say that this sandwich won, from a structure, a flavor, and a presentation level. Now I have one more question to pose. i am going to post a picture, and I would like you to comment on whether or not is is a sandwich. I will give you my thoughts next time. Preface: I love soup. Making it and eating it. If you don’t like soup, this blog isn’t for you. Is Stuffin Muffin Enough in Stuff? The Norman Rockwell, by Absurdly Good Stuffin Muffins: 192 grams of stuffing, turkey, cranberries, pecans, (and apparently Bacon I have found out afterwords) and I am sure a bunch of butter in muffin form. This had all the right ingredients to be a great sandwich (minus the Bacon… I don’t think I heard them say that there was the swine in this one, so maybe the day I had it didn’t have it? Anyway, now I know…) It had the sustenance, the textures, the balance of flavors, and surely the structural integrity. This thing was a muffin, made out of stuffing, and filled with things most people eat at a turkey dinner. I know a thing or two about Turkey Sandwiches and would like to think that I am fully aware of how to craft such a delicacy. It was dense. 192 grams (weighed on a calibrated scale of course), and the size of my fist. Due to the stuffing outside, it maintained it consistency and texture, and did not collapse or fail when toasted, bit into, or torn apart. This muffin dinner was a meal in itself, as any given sandwich should be. It needed a little bit of salt, but that came easily. it is difficult to make something for the masses and have everyone’s flavor pallets fully satisfied. I would have preferred to have a little bit of gravy with it, or maybe even a slathering of fresh cranberry sauce on the top, but then we run into the issues with portability and ease of eatability. It was handy, it was convenient, and it was flavorful; all of the things that a sandwich should be. But it was most definitely not a sandwich. That much is the honest truth. This is a muffin, not a sandwich, so why am I blogging about it? Am I guest Blogging for The Best Muffin Blog? Or did I forget what a sandwich was since I haven’t blogged for so long? Has the summer heat gotten to me? I think the answer is somewhere in the middle, on a more theoretical level. Maybe a little bit Foodlophical*? Why should I discriminate against a muffin, when it has mostly the same basic ingredients as a sandwich? There may be people that might actually classify a muffin of this caliber as a sandwich. I mean, if an empanada is a sandwich by my standards, why can’t I say a muffin is? I keep thinking of the Bill Cosby Standup about Chocoloate Cake. And how perspectives can be so different for some people. In the standup routine, Bill is told by his wife to go make breakfast for the kids, which he does not want to do. He goes downstairs and starts to get breakfast ingredients ready, when his 4 year old comes down stairs and says she wants chocolate cake. So he cuts the chocolate cake, and pours a glass of Grapefruit Juice. His other kids come downstairs and all want chocolate cake for breakfast as well. His wife comes downstairs, and sees that the kids are having chocolate cake for breakfast and has a kiniption, and sends Bill back to bed. I agree with the four year old, and am all for chocolate cake for breakfast, but I also know that Chocolate Cake is most definitely not a breakfast food. This is taking the last remaining strain of convention and beating it like the eggs were beaten while making that cake. This is how I feel about a muffin posing as a sandwich. Don’t get me wrong here, Nobody is every saying that it was a sandwich, and as far as i know, these guys have no intention of doing so. I am just pointing out that perspectives can vary from one person to the next. I stand upon princples when it comes to sandwiches, and I have a lot of rules that help uphold those standards. I have seen often that people have very few core motivations to do what they do. They base their opinions on either faith or investigation, and it is not very often that they will base their ideology on both. I have been a strong believer in the rules of sandwiches, which must contain above all others, layers, bread-like outsides, sustenance, and sauces. There are some fuzzy lines, that people often question, but I will tell you that there are 2 main reasons why these muffins will never be sandwiches in my book. They don’t have true layers, and they don’t have sauces. The other reason is the intent. They have no intent of being sandwiches. Just like the chocolate cake has no intent of being a breakfast food, but it shares similarities, a muffin should never have any crazy idea of being a sandwich. 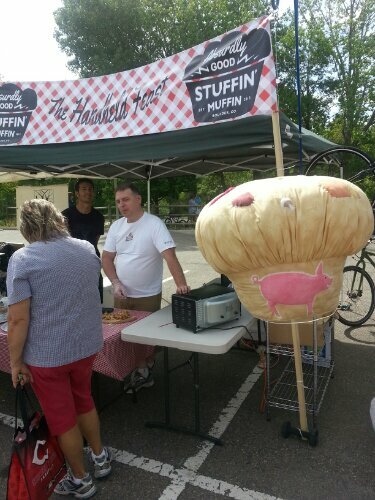 That being said, I highly recommend you give one of these a shot if you see them around at a farmers market. They use good ingredients, including love of the muffin, and are fun guys. So by now you may know, that I am not a huge fan of Jimmy John’s. I think their whole “Freaky Fast” thing is ridiculous, their business model is skewed, their advertising bugs the crap out of me an anyone who has to listen to any of their ads, their sandwiches all taste the same, and supposedly the highlight of the place is their mayo. For a guy who doesn’t eat mayo, I don’t think I can classify that as a highlight.